Imraan Shirazi, coach Akif Shirazi and Kieran Cocker in Bristol. Peterborough Police Amateur Boxing Club prospect Kacper Kozak narrowly failed to make it to the semi-finals of the Junior ABA Championships. 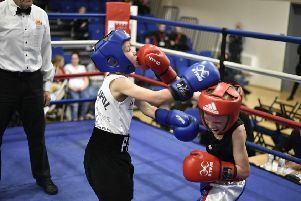 The 15 year-old from Orton boxed C. Hopkins from Moneyfields ABC in his 63kg quarter-final in Harlow on Sunday and lost on a close points decision to a taller and much more experienced fighter. Two Peterborough Police boxers travelled to Barton Hill Amateur Boxing Club’s show in Bristol on Saturday and did the club proud. Middleweight Kieran Cocker (21) took on a much taller foe in the shape of 6ft 4in Rohan Kale from the Empire ABC and successfully spent two rounds breaking his opponent down with some heavy blows to the body and through the middle. Kale tired and his guard lowered in the third round giving Cocker the opportunity to throw a flurry of hooks to the head and seal a unanimous win. Imraan Shirazi (11) from Bretton did everything asked of him in a gutsy performance against Sam Varey from Cirencester ABC in a 34kg contest but lost on a close points decision.